Marina tells us this is a tattoo of "Nazarena", or a traditional Portuguese fishmonger. "I am Portuguese-American, with roots in Nazaré, a small coastal town now famous as a prime surfing location. 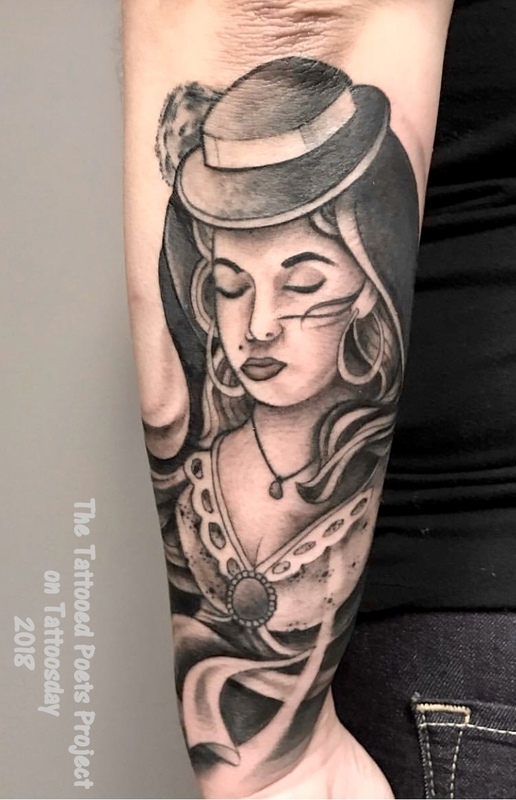 I wanted a tattoo that represented the beautiful fisherman's wives/ fishmongers that are integral to that landscape, so my tattoo artist (Sid Lopes from 7 Tattoo Gallery in Newark, NJ) and I came up with this design, which deviates a bit from the women's traditional garb but perfectly captures their essence." its eyes, red embers. Its ears, a bluff’s shadow. Its tail, a tremolo rodriguino. Marina Carreira is a Luso-American writer from Newark, NJ. Her chapbook, I Sing to That Bird Knowing It Won’t Sing Back was published May 2017 by Finishing Line Press. Her first full-length poetry collection, Save the Bathwater, is forthcoming next month from Get Fresh Books. 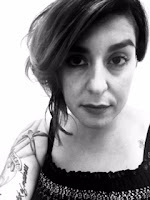 Marina's work is featured in Paterson Literary Review, The Acentos Review, Pittsburgh Poetry Review, Hinchas de Poesia, Luna Luna, The Harpoon Review, and Green Mountains Review, among others. Follow her on FB, TW (@maketheunknown) and IG (@thedreamisthetruth). Thanks tom Marina for sharing with us here on the Tattooed Poets Project on Tattoosday!